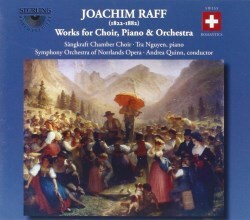 I have been impressed till now by the rather overlooked but beautiful and striking music of Joachim Raff. So I was pleased to have the chance to become better acquainted with his music by reviewing these three discs from Sterling. However, I was disappointed to find that none of these performances are good advocates for his music. I regret that I cannot recommend these, as poor quality performances do not do justice to the composer and could therefore give a falsely inferior impression of his output. The earliest of the three discs (which contains music for violin and orchestra) was recorded in June 2007, the second (the Suite for Piano and Orchestra, and overtures and preludes from operas) in June 2009 and the third (entitled Works for Choir, Piano and Orchestra) in December 2009. They all bear covers depicting pastoral scenes, and have fairly extensive booklets. These are in a rather old-fashioned setting and layout, but with scholarly and in-depth notes (albeit the author is a bit obsessed with counting numbers of works). The appearance and design isn’t fabulous: the cover design of the 2007 disc looks better to me than the later discs, as its picture fills the whole page rather than being an insert surrounded by a ghastly thick and clunky shadow. The first disc also has the benefits of a clearer-looking back inlay and a proper track listing in the front of the booklet (which the other discs don’t have at all), while its booklet pleasingly contains quite a few images and musical examples. The most recent disc has a chunkier-than-usual, and very plasticy-feeling, case (I think it’s meant to be superior but actually feels a little tacky). The presentation and layout of this booklet is much better than the previous two discs – far better spaced, clearer, more attractive and readable. The back inlay looks better too. Thus for the aesthetics; now for the recordings. Our first disc has the worst recorded sound I think I’ve ever heard. It utilises the same venue as the second disc (the Umea Concert Hall), but it sounds completely different and immensely reverberant – as if it has been recorded in cavernous swimming baths, rather than a concert hall. Unless the concert hall had been significantly rebuilt by the time of the second disc, the only explanation I can think of is that the engineers added an inexplicably huge amount of ambient sound in this first disc. Le fee d’amour, a “morceau caracteristiques de concert”, opens the disc, followed by the Suite for Solo Violin and Orchestra, and the Concerto for Violin Orchestra no.1 in B minor. The intonation of the violin soloist, Tobias Ringborg, isn’t always secure, and the sound of the violin is very hard-edged but that is most likely the appalling recorded sound, not the poor violinist! Ringborg is, however, very clean in executing fast scales and arpeggios – excellently so, and at times he reminds one of Leonid Kogan in this. The orchestra – Symphony Orchestra of Norrlands Opera, conducted by Andrea Quinn – is adequate here. 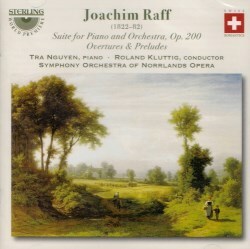 The disc recorded in June 2009 opens with the Suite for Piano and Orchestra of 1875, and the quality of the performances of the Symphony Orchestra of Norrlands Opera are less good here, this time under a different conductor, Roland Kluttig. The orchestral playing lacks incision and preciseness, ensemble is often to be desired, and entries are occasionally fractionally late (and the tone of the cellos at one point in the Cavatina is extremely nasal and unpleasant). The pianist Tra Nguyen has plenty of sparkle in her sound; however, in the slow movements the piano lacks the sense of cantabile line that would be desirable; Nguyen is too “note-y”, and not very musicianly. The suite is followed by a number of overtures and extracts from operas, and I found the track break between the suite and the overture from Die Eifersuchtigen (“The Jealous Ones” – Raff’s sixth, and final, opera) far too short to give a clean sense of break between the two, very different, works. 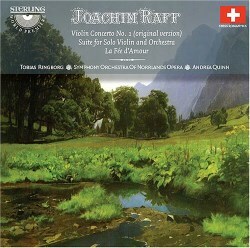 The next work on the disc is the overture from Konig Alfred – a “heroic” opera depicting Alfred the Great and his courage in dealing with Vikings; the overture contains suitably dramatic and heroic music, and is followed by the Prelude and Intermezzo from Dornroschen (“Briar-Rose”, a variant of the Sleeping Beauty story), an “Epic Fairy Tale in a Prelude and Four Parts” for vocal soloists, chorus and orchestra. The disc ends with the Prelude to the Third Act of Raff’s biblical opera, Samson. The orchestral playing sadly remains under par throughout the disc. Of course, this isn’t helped by extremely literal translations, which mean that the texts come across as ridiculous, as there is no sense of idiom. Yet whilst one approves of the full documentation which provides texts and translations in the CD booklet, another part of one wonders whether a greater service wouldn’t be done in actually leaving these out, to enable one to focus on the music rather than being distracted by the awful poetry. An interesting dilemma! On the whole, then, I can only applaud Sterling for trying to disseminate the music of Raff more widely, but I cannot recommend the discs themselves, fraught as they are with various problems. Instead, I would advocate that anyone interested in hearing Raff’s music trying the wonderful Symphonies 3 and 4 on Hyperion with Hilary Davan Wetton, or No.5 on Chandos – far safer and more convincing choices!